The semi-final of the Olympic Qualifying Tournament is really a Final 4 with the winner going to the Olympics and the rest going home empty handed. Yuko Oga (in picture) from Japan explained after her team had lost to the Czech Republic (47-53) that she only joined the team three weeks ago because she had returned from rehabilitation and despite the defeat the team was okay and would be focused for the next game. She kept her word as she took over the point guard duty in their semi-final match and knocked in 20 points and dished out 5 assists in the victory against Korea. In the second quarter-final, Canada not only won the rebounding stakes against Argentina but also the match (58-41) to book their place in the final game against Japan. You can move to any game report by clicking on the links below or by scrolling down the page. Japan fired in 21 straight points to lead (23-2) after seven minutes. They more or less killed the game as a contest by the end of the first quarter (29-4). Japan hit 11-of-15 shots from the floor during the first 10 minutes. 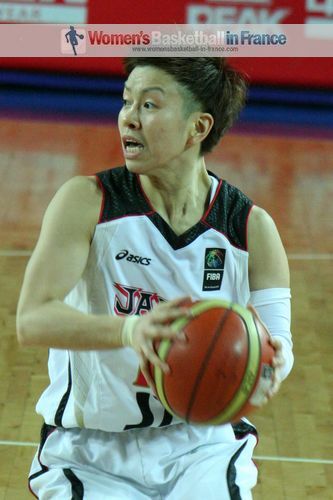 Although their percentage dropped during the second quarter Japan went into the locker room leading (47-20) with Yuko Oga on fire with 18 points and 5 assists. With Yeon Ha Beon and Jung-Ja Sin struggling offensively for Korea, Japan were not really handicapped by the foul problems for Yuka Mamiya. Instead the Japanese bench took over from the starters during the second half and protected the advantage all the way to the end of the match. During the 2008 Olympic Qualifying Tournament in the semi-final Japan had been eliminated by Cuba and since have also been on a seven-game losing streak against Korea. Japan will face Canada in the last match of this competition for the last place in the 2012 Olympic Games. The two teams appeared not to take any risks during the first quarter and instead played defensively. Canada are physically bigger and stronger than Argentina and led early (6-2). However Argentina are solid free-throw leaders and managed to draw a few fouls to gain free trips to the charity stripes. They eventually went in front (12-10) shortly after seven minutes. 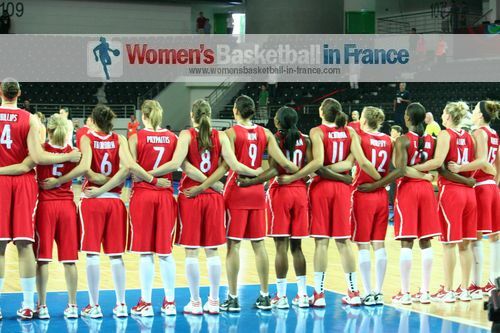 Canada continued to attack the paint and eventually edged the first quarter (16-15). The second quarter was slow as Canada dominated the battle of the boards and conceded just 4 points as they shut out Argentina. Canada were not much better offensively but went into the locker room with an increased advantage (26-19) after Courtnay Pilypaitis hit an end-of-quarter buzzer beater. The game did not get any better during the third quarter as Canada controlled the tempo and extended their lead going into the final quarter (36-25). Unfortunately Argentina could do nothing against the rebounding strength of the Canadians and the contest just fizzled out with Canada strolling to victory (58-41).